An 11-year-old growing up in Memphis has no problem pitching on the baseball field, but speaking is a daily struggle. He stutters to the point where he cannot even say his own name. But this summer, he takes his friend's paper route, knowing he'll have to interact with strangers. It's the run-in with the local junk man that gets him into serious trouble, however. It's a summer that will change his life. I'm torn over this book. I will first start with the praises, because it deserves many. Told from the boy's perspective (and as it is partly a memoir) the author is able to express the frustrations of stuttering in a deeply intimate way. He also addresses serious topics such as race in 1959 Tennessee, and discovering one's identity. The writing style is genius and unique. However, (yes a big however), from a purely entertainment perspective, this story was--dare I say it--boring. I don't know that a child would pick it up to read for fun, but it is an excellent tool in the classroom. 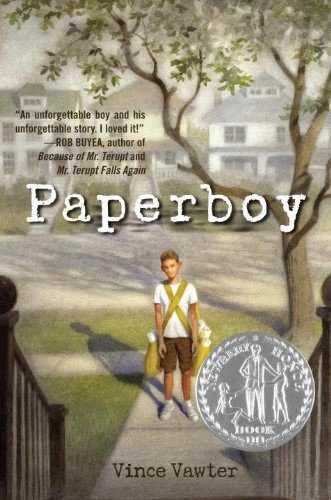 I can understand why it was nominated for the Newbery, but I don't think I'll be reading it again.